Native Americans were often grouped into tribes or nations. These groupings were generally based on peoples that shared the same culture, language, religion, customs, and politics. There are over 1000 Native American Tribes in the United States. Sometimes tribes were also grouped by the region of the United States they lived in (like the Great Plains Indians) or by the type of language they spoke (like the Apache). Below are some of the major groupings and tribes. Arctic/Subarctic - These Native Americans survived some of the coldest weather on the planet. They include the Inuit people of Alaska who lived primarily off of whale and seal meat. Californian - Tribes living in the area that is today the state of California such as the Mohave and the Miwok. Great Basin - This is a dry area and was one of the last to have contact with Europeans. The Great Basin tribes include the Washo, Ute, and Shoshone. Great Plains - One of the largest areas and perhaps most famous group of American Indians, the Great Plains Indians were known for hunting bison. They were nomadic people who lived in teepees and they moved constantly following the bison herds. 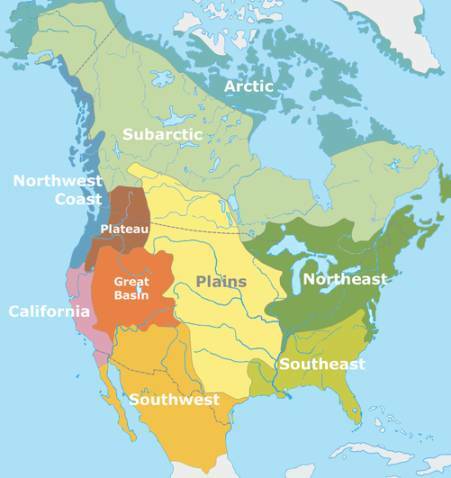 Tribes of the Great Plains include the Blackfoot, Arapahoe, Cheyenne, Comanche and Crow. Northeast Woodlands - Includes the Iroquois Indians of New York, the Wappani, and the Shawnee. Northwest Coast/Plateau - These Native Americans were known for their houses made of cedar planks as well as their totem poles. Tribes include the Nez Perce, Salish, and the Tlingit. Southeast - The largest Native American tribe, the Cherokee, lived in the Southeast. Other tribes included the Seminole in Florida and the Chickasaw. These tribes tended to stay in one place and were skilled farmers. Southwest - The southwest was dry and the Native Americans lived in tiered homes made out of adobe bricks. Famous tribes here include the Navajo Nation, the Apache, and the Pueblo Indians. Algonquian - A large group of over 100 tribes that speak the Algonquian languages. They spread across the entire country and include tribes such as the Blackfeet, Cheyenne, Mohicans, and the Ottawas. Apache - The Apaches are a group of six tribes that spoke the Apache language. Iroquois - The Iroquois League was a grouping of five Native American Nations: the Seneca, Onondaga, Mohawk, Oneida, and Cayuga. The Tuscarora nation joined later. These nations were located in the Northeastern part of the United States. Sioux Nation - The Great Sioux Nation is a group of peoples generally called the Sioux. They are divided into three major groups: Lakota, Western Dakota, and Eastern Dakota. The Sioux were Great Plains Indians.